As you may have noticed, Amazon has started making their own...well, almost everything. Including luggage. But the big question is, is it any good? After all, they have some stiff competition from Samsonite, Travelpro and their friends. So, in this review we are going to dive into the 3 main categories of Amazon Basics luggage and find out if it's worth your money. Tip: Use the Quick navigation below to jump the the relevant section. 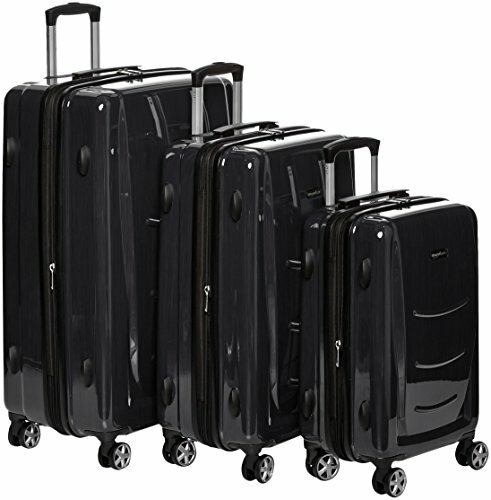 There are 4 different types of luggage in Amazon’s range, and they are pictured below. As you can see, there are 2 hardshell suitcases. The main difference between the 2 is that one has a textured finish and the other has a shiny finish. All other features are the same, so both suitcases will be covered in one section of the review. The other 2 pieces of luggage are the softshell suitcase and the underseat carry on. With these 2 products, there is less variety than with the hardshells, most likely because they are less popular. 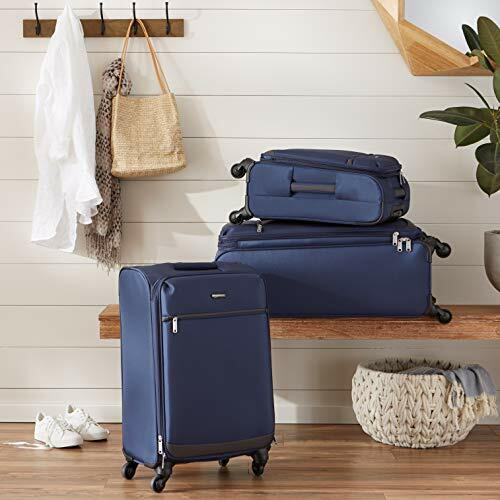 All of their luggage has something in common – it is covered by AmazonBasics Three-Year Limited Warranty, except for the underseat carry-on, which is backed by Amazon’s 1-year warranty. The warranty covers any manufacturing defects, so if you receive a faulty product, you can exchange it immediately. However, the warranty does not cover any damage caused in transport, and it does not apply to residents outside of the United States. The main difference between the two hardshells is the finish. 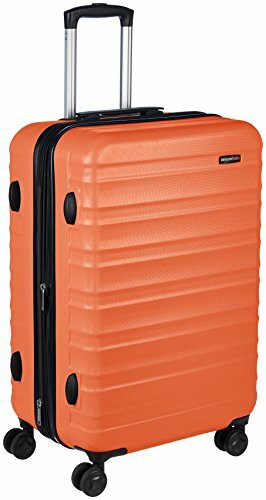 Both suitcases are made of extra-thick ABS, but one has a textured finish, which is supposed to make the scuffs and scratches less visible. The other hardshell has a shiny finish that is supposed to be more aesthetically pleasing. Additionally, the textured luggage is available in a wider range of colors than the shiny one. You also probably noticed that the dimensions differ significantly. This is because, when listing the dimensions of the shiny luggage, Amazon included the height of the handle. 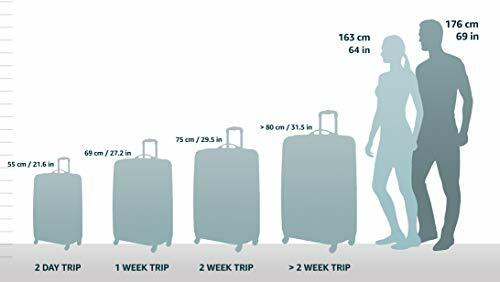 I am saying this because the shipping weights of the respective sizes of the suitcases are virtually the same, which wouldn’t be the case if there really was such a actual size difference in the cases. Spinner wheels. 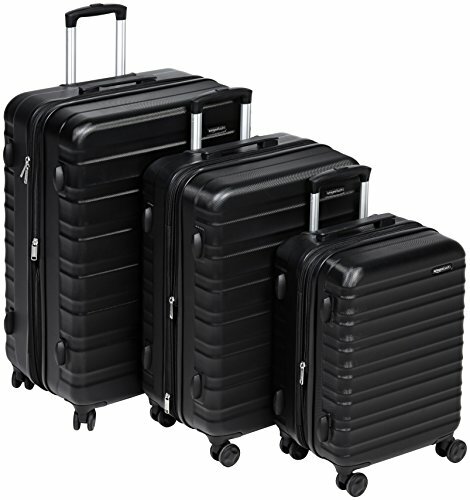 Both hardshell versions are equipped with double spinner wheels, which is a rare, but very much appreciated inclusion, particularly when looking at affordable luggage (usually only the big guns with high price tags have them). These kinds of wheels mean that you don’t have to tilt your suitcase to get the wheels rolling. 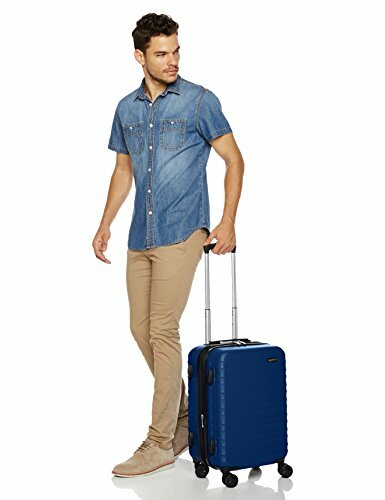 In fact, you can push the suitcase, pull it or even roll it alongside you, which puts much less strain on your arms and shoulders. Two packing compartments. The interior of both hardshells is fully lined with 150D-polyester, and features 2 packing compartments. The bottom compartment has elastic straps to keep you belongings in place. On the other side, the top compartment has a zippered divider (always a bonus!) with 3 zippered pockets for any smaller things you want to keep separate. If organization is your biggest concern, I believe these suitcases won’t let you down. As you can see, these are basically the same size as the hardshells, but they are lighter. That’s always a benefit of softshell luggage, as well as the fact that it is more flexible. A 21” softshell could fit into a space in which a 21” hardshell couldn’t fit, because the soft shell can be collapsed a little, so that the suitcase can be squeezed into a tight space. Spinner wheels. 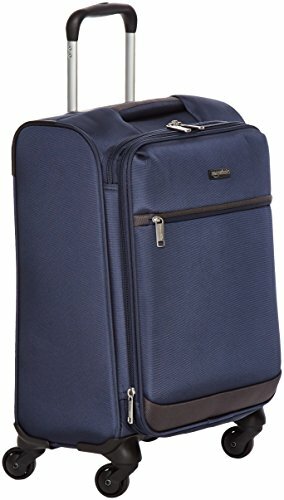 They really add value to the softshell suitcases, so it’s a good thing that the AmazonBasics softsides feature double spinner wheels. They will provide you with excellent maneuverability of your suitcase, and allow you to push/pull/roll your suitcase however you want. Additionally, these wheels put much less strain on your arms and shoulders, so you can say goodbye to painful trips to the airport. Expandable by 25%. All 4 softshells can be expanded up to 25%. Additionally, if you over pack your suitcase, you’ll see that they can probably be expanded even further. This is because the soft shell conforms to the shape of your clothing, even when the suitcase is overflowing. But to get back to the point, being able to expand the capacity of your suitcase is always a bonus, so kudos to Amazon for remembering to include this feature. Exterior pocket. I wouldn’t really call this a pocket, but rather an exterior compartment. It is quite large, and you can store things in it that you want to have easy access to. The first thing that comes to mind is a laptop; however, since there is no lock on this pocket, maybe it wouldn’t be such a great idea to store expensive electronics in it (if it’s not going to be in your sight all the time). Telescopic wheel handle. The wheel handle extends and locks to one height setting. Not everyone will find that the height of the handle fits them perfectly, so do check the measures before you purchase anything. A handle that is too short or too long kind of defeats the purpose of the amazing double spinner wheels. In addition to that, there are also 2 carry handles on the suitcase – on the top, and on its side. One packing compartment. This is quite common for softshell luggage. 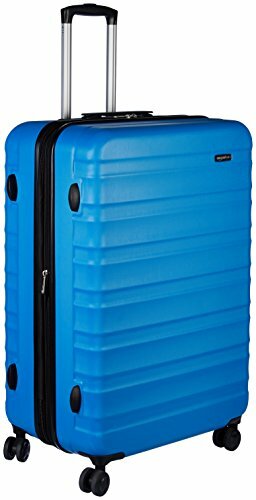 The AmazonBasics suitcase has a single, fully lined packing compartment. There are 3 zippered pockets inside the suitcase, which will help you stay organized during your travels. However, the tie-down straps in the compartment are somewhat weird – they are not elastic, but rather firm. When you want to secure your items you have to tighten the straps manually. I’m not a fan of this feature because if you put too much pressure on your clothing, it will unavoidably get wrinkled. The bag is made of polyester fabric, and it has several exterior pockets. 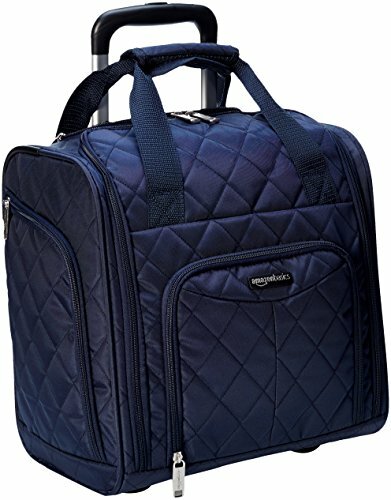 This makes it perfect for a carry on, because it allows you to organize your things, and keep the most important items handy. The size of the bag also makes it perfect for a carry on, as it can fit in most airline overhead compartments, as well as under the seats. 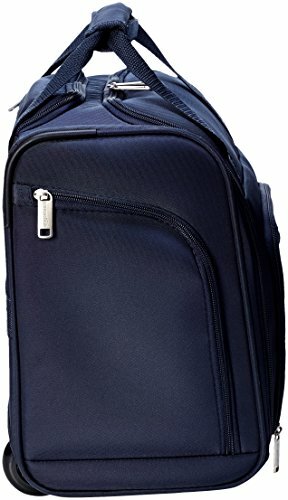 Additionally, the bag also features a slit on its back, which allows you to secure it to the handle of your suitcase. On the exterior of the bag, you will also find skate wheels, coupled with a telescopic pull handle that locks with the push of a button when it’s extended. This is the part that I like the most – even though it’s a small bag, sometimes you simply don’t have the energy to carry it around. When such a time comes, just pull out the handle and pull it behind you (like a boss). However, there is a pair of carry handles, which appear to be very sturdy. The wheels are not spinner, which is kind of what I expected anyway. On the inside, the AmazonsBasics bag is fully lined with nylon. The main compartment is quite roomy, and you can fit all the items you might need during the flight in it. Additionally, I’m pretty sure you could fit a day or two’s worth of clothing in there, so this could also serve as a back up for some very short trips. There are 2 breathable mesh pockets and 2 small pockets, all of which are zippered. They are great for storing jewelry, pens, or any other small items that you are likely to misplace in a large suitcase. 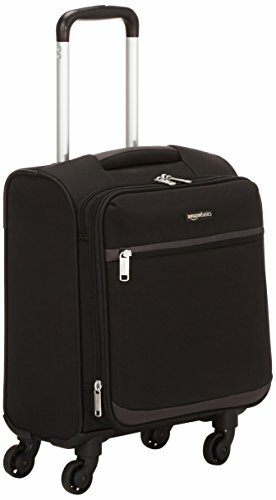 Overall, the AmazonBasics luggage appears to be a great cheap alternative. One thing I didn’t mention earlier – all the suitcases can be purchased in sets of 2 or 3, and they are even cheaper that way. 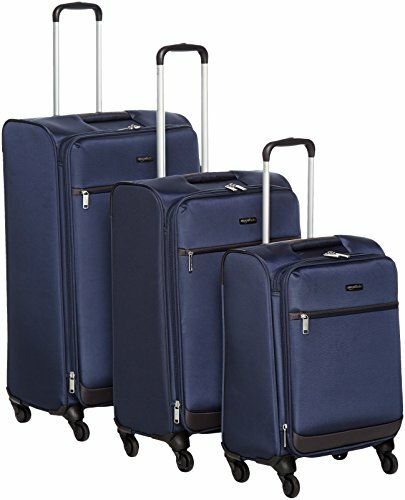 For less than $150 you could equip yourself with 3 suitcases, which sounds like a really good deal to me. Protective hard shell with a glossy finish for a sleek, modern appearance; made of extra-thick ABS for enhanced strength and durability. NOTE: Luggage comes with protective film to protect quality in transit, please remove before use. The hardshells are obviously my favorite, especially the textured ones. I’m a big fan of bright colors, and there are plenty of them to choose from in Amazon’s range. The only downside of the hardshells is that they don’t have a lock, but if you can overlook that, these would make a great investments. The softshells have a few advantages over the hardshells – the lighter weight and the exterior compartments. However, the softshells don’t have a lock either, which really is a bummer. Nevertheless, they still have some amazing features such as the spinner wheels and expandable capacity. If you are a fan of softshell luggage, definitely consider adding this one to your collection. 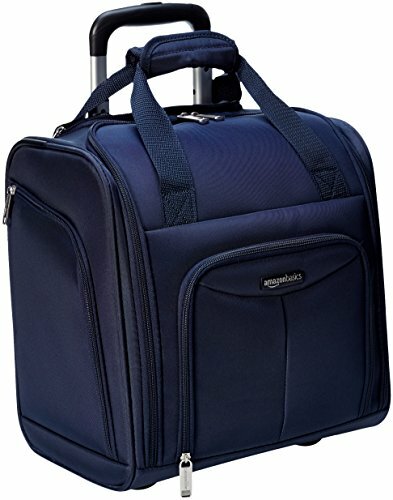 The underseat carry on is a great choice for anyone who’s looking for a smaller in-cabin bag. 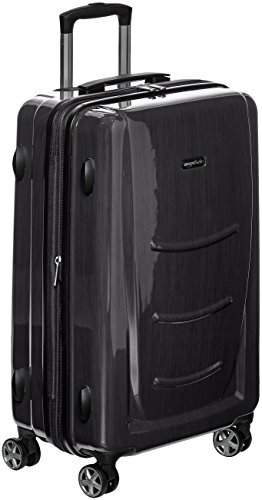 It could also replace your carry on suitcase if you’re going on a very short trip, and the telescopic handle will remove all the hassle of having to carry it around. Additionally, it has a ton of pockets that really help with staying organized. If you aren’t really impressed by the AmazonBasics luggage, then check out this review of the best hardshell suitcases in 2018. However, if you loved them as much as I did, then head over to Amazon – you can’t get them anywhere else!